The best way kids can learn and remember their lessons is by drawing and writing. 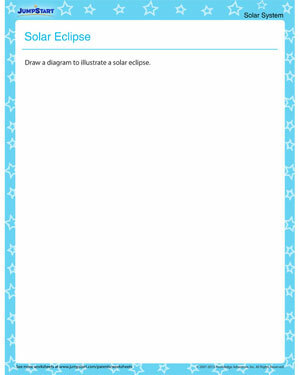 ‘Solar Eclipse’ is a great Solar System worksheet that requires them to draw an accurate labeled diagram of a solar eclipse. The free Solar System printable comes with a suggested answer key that features a suggested diagram of the same. Help them understand the beautiful science phenomenon of the universe with this free Solar System printable worksheet.